Return to the Home Page for a complete index for Racing From The Past. Photo contributed by Steve Adkins. John in action at Riverside, MO. Terry Brumley drove this #33 and was from the Springfield, MO area. Photo contributed by Lynn Sanders. Vester Cates from Lawson, MO at the Springfield, Missouri Fairgrounds. Vester was a regular at I-70. Bill Crane in the #48 from Kansas City at the Springfield, Missouri Fairgrounds Speedway. 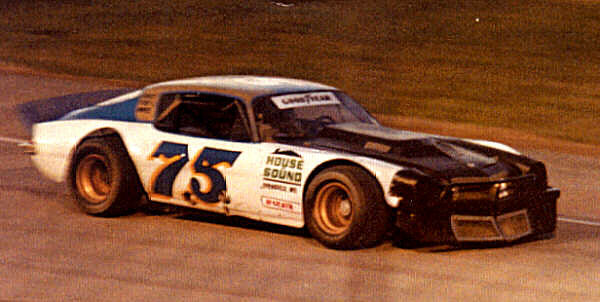 Fred Whisler drove this #75 from Independence, Mo. This was taken at the Fairgrounds in Springfield, Missouri. Even after 20+ years this driver probably needs no introduction. When Larry Phillips from Springfield Missouri entered a race, it was a real possiblility he would end up taking home another victory. Larry Phillips was right at home on dirt or asphalt. It didn't make much differences, he won on both many times. A teenage Mark Martin from Batesville Arkansas. Mark was a champion in his younger days as he is today. Maybe 2003 will bring a Winston Cup Championship for Mark. Next to Mark is the #0 of Jay McIntosh of Willard, MO. Jay was a veteran of the soutwestern Missouri tracks. The southwestern Missouri drivers had the best of both worlds, dirt and asphalt, and Jay was right at home on both. Rusty Wallace in the #66 from St. Louis, Missouri working his way up to Nascar. It hasn't been very long ago that Rusty used to show up and race the locals as a NASCAR star. Willie Crane drove this #32. This was shot at the Springfield Missouri Fairgrounds. Photo contributed by Mike Evans. Dave Wall from Kansas City Kansas at I-70. RIP Dave! For a complete list of pages at Racing From The Past check the Home Page.